Q. How do I send a copy of a chat transcript to myself? 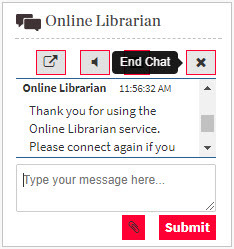 Once the conversation has ended with the Online Librarian, click on the x icon to end the chat session. Enter your email address then click on the Email Transcript button. 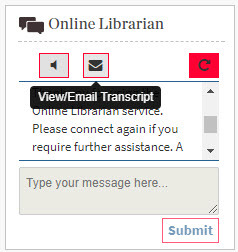 A confirmation message will appear on screen once the transcript has been emailed successfully. This will only take a moment. How can I use the pop out feature for the Online Librarian chat box?